For as long as we’ve owned the inn (which has been quite a few years now!) we’ve recognized how much our guests enjoy watching all the birds and wildlife around the inn. And Central Ohio has plenty of both. So each year, some time in late April, I bring out my hummingbird feeders, clean them up, boil up some sugar water, fill the feeders, hang them on the front porch and wait. If I don’t do it early enough, sometimes we see a lone scout or two hovering in mid-air, right where the feeders normally hang. So we know the same birds are returning from the previous year. For the first few weeks we get a few little visitors to the feeders. 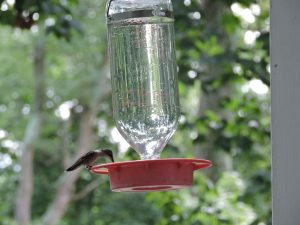 But by this time of year, early August, we are feeding at least 40 or 50 Ruby Throated Hummingbirds a day, sometimes a dozen at the feeder at one time, going through about 2 quarts of sugar water every day. Most of our guests are amazed at how many there are and how they tweet and squabble at the feeders. The two questions we are asked most often are “what type of feeder is that?” and “what do you put in it?” We really like the feeder in the photo. It’s called, appropriately enough, “The BEST hummingbird feeder.” You can buy it on Amazon. And in our opinion it is the best. It’s sturdy. The glass bottle is easy to clean. There are no little plastic flowers to break off. And the whole bottom comes apart for cleaning. 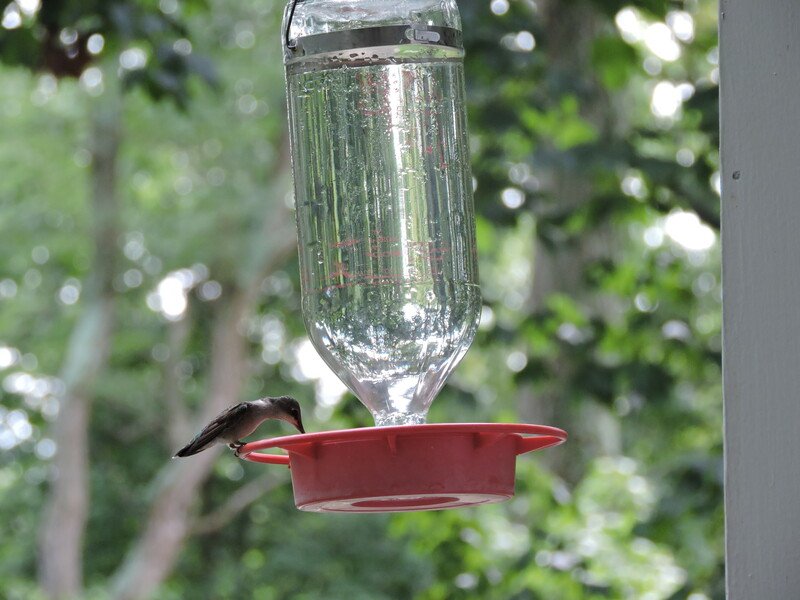 Cleanliness is really important for hummingbird feeders. As to what we put in it – simple sugar and water. 4 cups of water to 1 cup of sugar. Boil the water, dissolve the sugar and let it cool. In about a month’s time they’ll all be starting their migration South to Mexico for the winter, so if you want to catch a glimpse of them before they go, come and see them soon!